Five very important hair loss questions are listed below. 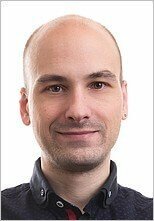 Questions that only the skull expansion hypothesis can answer - no other theory for hair loss (including the current conventional theory) can fully address the issues raised. The previous pages in this section gave strong evidence in support of the skull expansion hypothesis, which states that skull bone growth causes androgenetic alopecia. It’s well known that this condition is connected to genetics and the hormone dihydrotestosterone (DHT). But exactly how these two things combine to create one of the most frustrating and distressing conditions known to man has been pestering hair loss experts for years. But, as you'll see below, the skull expansion hypothesis finally solves this mystery. Q1. Genetics: Which genes actually initiate the hair loss process? Q2. Hormones (the DHT paradox): How can DHT cause both hair growth and hair loss? (DHT produces body and facial hair growth from puberty onwards). Q3. Rate: Why does the rate of hair loss vary so much? (Some men suffer rapid hair loss as early as puberty and become completely bald by the age of 30; for others, hair loss doesn’t start until much later on in life, and can be a much more gradual process). Q4. Region: Why do some people only start losing hair from the front of the scalp (receding temples), or the back (a bald patch), while others lose hair from both these regions at the same time, often forming the familiar "male pattern baldness" profile? Q5. Remnant hair: Why does "remnant" hair often keep growing? (Remnant hair is strong healthy hair that continues to grow normally within the hair loss region despite complete baldness all around it – see arrow A in the pictures below). I believe these questions are extremely relevant to the hair loss process. And, as such, it’s vital that complete, accurate answers are given before any theory can be recognized as the true cause of this condition. However, the current theory cannot answer all these questions. Please note that only very brief answers are given below. For complete answers, read the previous pages in this section or the skull expansion ebook (see next section below). A1. Genetics: The genes responsible for this type of hair loss are those that determine skull shape. A2. Hormones (the DHT paradox): DHT is a steroid hormone and, as such, will stimulate the growth of hair, muscle and bone. And this includes certain bones of the skull in those who develop hair loss. When the skull expansion process starts causing hair follicles to miniaturize, the body tries to get the hair growing normally again by using the hair growth promoting effects of DHT. So it increases DHT production in the hair loss region of the scalp. But this process (called upregulation or hyperandrogenicity) is unsuccessful. (You can learn why upregulation doesn't work by reading this article). A3. Rate: The rate of hair loss, when it starts, and the extent to which it develops mostly depend on the shape of the skull. Certain skull shapes will develop hair loss much earlier, faster and severely than others. A4. Region: Receding temples are caused by frontal bone growth; a bald patch at the back is caused by parietal bone growth. And growth of the frontal and parietal bones together will cause hair loss at both the front and back of the head. This also explains how the familiar "male pattern baldness" profile (horseshoe shape) nearly always seems to develop for most men. A5. Remnant hair: Remnant hair sometimes continues to grow in areas within the scalp that remain relatively free from skull expansion. This means that hair can sometimes keep growing at the crown of the head where the frontal and parietal bones meet, or at the front where the hairline recedes. Skull expansion is, without doubt, what causes hair loss in millions of men and women around the world. It provides the true underlying mechanism behind androgenetic alopecia and can explain the genetic link to hair loss, how the hormone DHT is involved, and provide answers to those very important questions above (something the current theory cannot do). And if you're still in any doubt about the skull expansion hypothesis, why not simply contact a hair loss specialist and ask those five questions - I guarantee they will not know the answers! 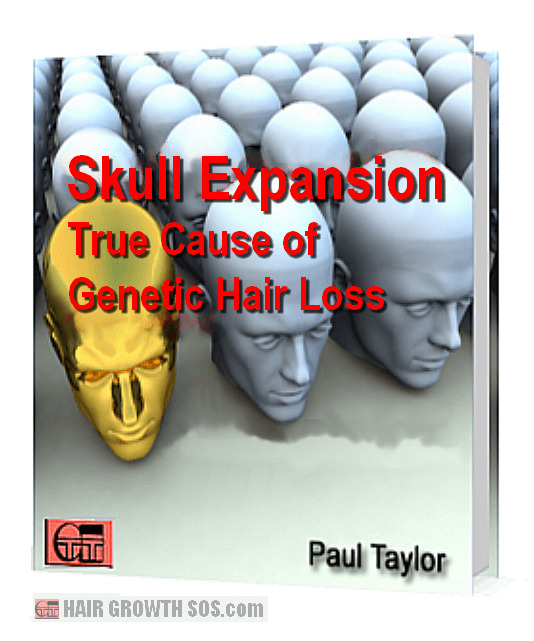 "Skull Expansion – True Cause of Genetic Hair Loss"
1. It fully explains exactly why the current theory for hair loss is wrong. 2. It proves beyond doubt how skull expansion causes this type of hair loss in men and women. 3. It reveals just how badly hair loss affected me, and how I eventually managed to find a solution. 4. It also has a nice little surprise right at the end. So now you finally know what’s causing your hair loss, what can you do about it? Is it really possible to stop hair loss and get your hair growing normally again? As already mentioned, I’ve suffered this type of hair loss myself. And it was from my stubborn refusal to go bald (as well as my complete and utter frustration when the hair loss experts I asked were unable to answer my questions) that I began studying androgenetic alopecia – work which was to take me seven years before I finally realized that skull expansion was the reason behind this condition. Of course, once you fully understand a problem, you can then set about finding a solution. 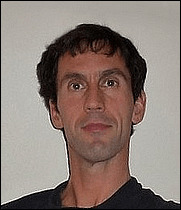 You can learn about when and why I posed those hair loss questions to the experts, and what my solution was, by reading this page. Medical Hypotheses, Volume 72, Issue 1, January 2009, Pages 23-28, Taylor PJ. This is page 6 of 6. Read previous page? Extreme skull expansion – extreme hair loss.